Jerry Gerndt was born in 1942 in Oconto Falls, Wisconsin. He was commissioned a 2d Lt in the U.S. Air Force through the ROTC program at the University of Wisconsin on January 23, 1965, and went on active duty beginning April 18, 1965. Lt Gerndt next completed Undergraduate Pilot Training and was awarded his pilot wings at Reese AFB, Texas, in May 1966, followed by F-4 Phantom II Combat Crew Training and then service as an F-4C pilot with the 46th Tactical Fighter Squadron at MacDill AFB, Florida, from May 1966 to March 1967. He then served as an F-4D pilot with the 555th Tactical Fighter Squadron at Ubon Royal Thai AFB, Thailand, from March 1967 until he was forced to eject over North Vietnam and was taken as a Prisoner of War on August 23, 1967. 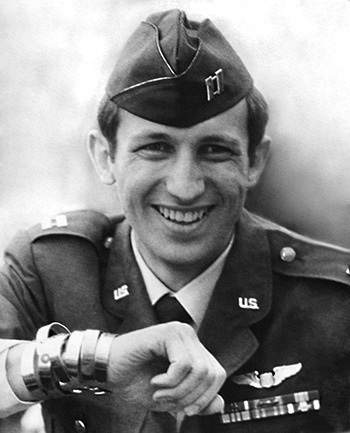 After spending 2,031 days in captivity, Capt Gerndt was released during Operation Homecoming on March 14, 1973. He was briefly hospitalized to recover from his injuries at Wright-Patterson AFB, Ohio, and then left active duty on August 10, 1973. After leaving the Air Force, Jerry flew commercial airliners for 10 years, and then received his MBA from Stanford University. He was married in 1976 and has two adult daughters. For the Period August 1967: This officer distinguished himself by gallantry and intrepidity in action in connection with military operations against an opposing armed force during the above period while a Prisoner of War in North Vietnam. Ignoring international agreements on treatment of prisoners of war, the enemy resorted to mental and physical cruelties to obtain information, confessions, and propaganda materials. 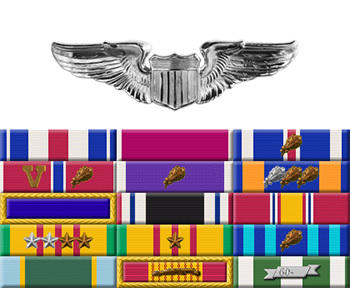 This individual resisted their demands by calling upon his deepest inner strengths in a manner which reflected his devotion to duty and great credit upon himself and the United Stated Air Force.